Strong trade winds supercharged by powerful hurricane winds threaten Hawaii. Hurricane Lane is expected to turn northwest toward the main Hawaiian Islands later this week. 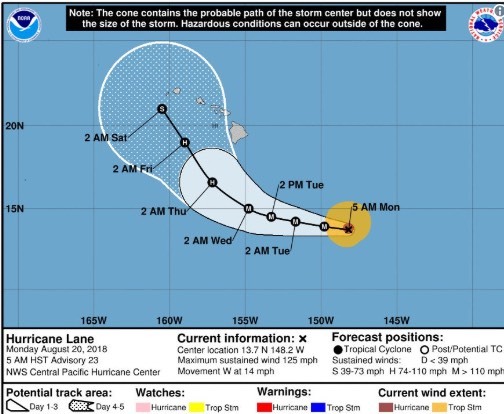 As Lane approaches the Big Island the south through west sections of the island may experience tropical storm conditions with winds 30 mph or greater starting on Wednesday night. Expect periods of heavy rainfall, especially along the southeast and east facing slopes. Storm total rainfall amounts of 10 to 15 inches with local amounts greater than 20 inches possible. Swell generated by Lane could bring very large and rough surf and dangerous rip currents for south and southeast facing shores. Looking at the first part of the animation above for tomorrow it just looks like a day with especially strong trade winds from the North Pacific High. Notice the typical venturi effect in the channels between the island. 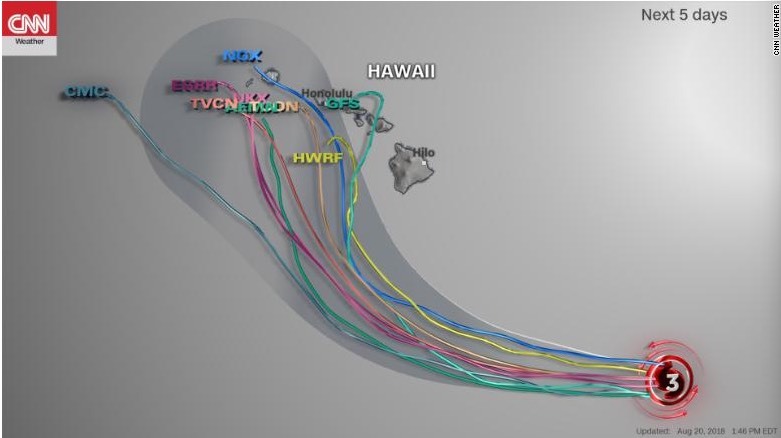 However, the second part of the animation shows the approach of Hurricane Lane. Currently, Lane is a category 3 hurricane with maximum sustained winds of 125 mph. The next image, from NOAA, shows the probable pathway of the hurricane. Now imagine those hurricane winds being funneled through those channels! Notice that there is a cone of probability for the path of the hurricane. This probability cone is not just a margin of error but rather a range of pathways from different computer models. Meteorologist look at the output of each model and rank the relative accuracy in recent days and in the past to produce this cone. The CNN graphic below shows the individual model tracks. Let’s hope that the GPS model is not accurate! Lastly here is the iwindsurf.com version of the ARW model for the islands for today and this coming Thursday. Quite a difference! Notice how the hurricane winds + NPH winds show the same venturi effect in the channels but also build on the crest of the mountains. Probably not a good time to visit Haleakala or sail S turns on Maui. ‹ West Coast Wind Blog: Heat wave ends but winds fizzle at many sites.